Boasting decades of history, the Oshiro District Harvest Festival features the largest of the tugs-of-war in Nanjo City, participated in by some 200 people from the district. The tug-of-war is held to pray for an abundant harvest and good health. 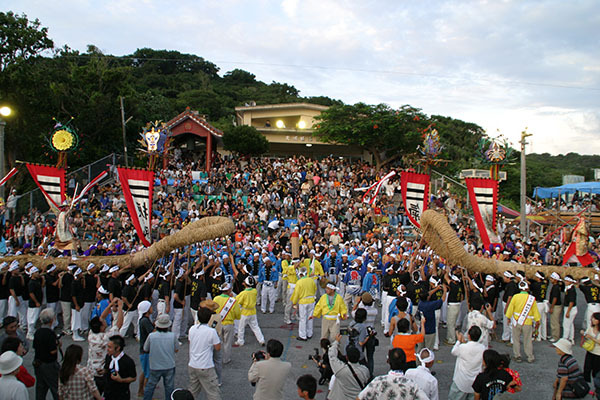 Before the event starts, a parade of the east and west teams takes place, each featuring the head banner bearer, who is then followed by members carrying the rope, the gaaee (banner display) performers and Okinawan folk instrument musicians, who together create excitement and a more competitive atmosphere at the event site.